Though fall doesn’t officially begin until Tuesday, pumpkin is everywhere. 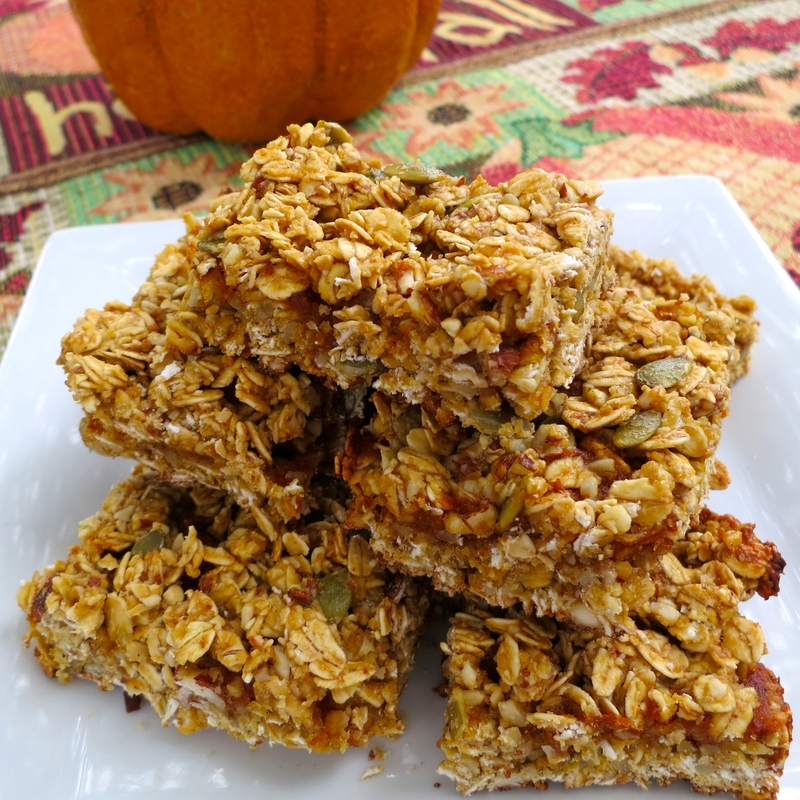 I am not ashamed to admit I love all things pumpkin spiced, and these pumpkin butter granola bars are no exception. I love that these granola bars are full of healthy ingredients, and are sweet enough without being too sweet. The layer of pumpkin butter in the middle of the bars makes them hit that perfect sweet spot. The pumpkin butter layer almost reminds me a little of fig newton, with a pumpkin spice twist! The nuts pack the bars with healthy fats and protein, resulting in a satisfying snack that will keep your hunger at bay. 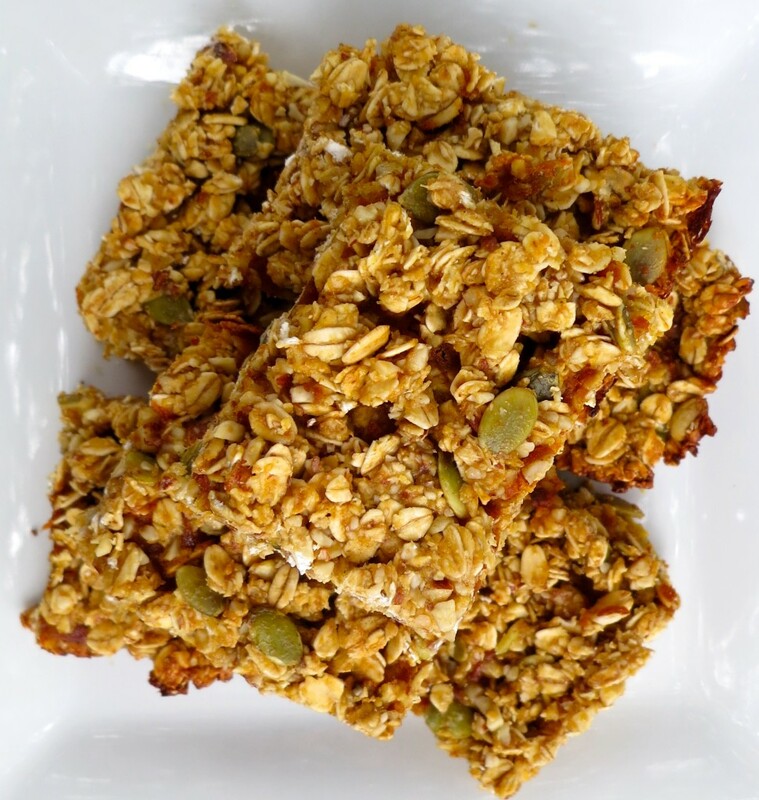 Like all granola bars (and granola), this recipe is easy to whip together so that you always have these healthy snacks on hand. 1)	Preheat oven to 325 and grease an 8×8 baking pan. 2)	Chop up the nuts in a food processor. 3)	Mix the oats, flour, wheat germ, almonds, cashews, pepitas, and salt in a large bowl. 4)	Beat an egg and mix together the egg, honey, and 2 tbsp. of pumpkin butter. 5)	Add the wet ingredients to the dry ingredients and stir until combined. 6)	Put about 2/3 of the mixture in a greased 8×8 baking pan and press down. Spread the remaining 6 tbsp. of pumpkin butter on top of the mixture, then place the remaining 1/3 of the mixture in an even layer on top. 7) Bake at 325 for about 25 minutes. 8)	Let cool, slice into bars or squares, and enjoy! 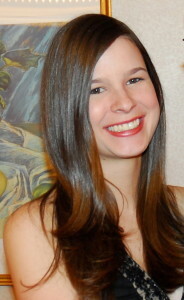 This entry was posted in Breakfast, Gluten-free, Recipes, Snacks and tagged gluten-free, granola bars, pumpkin, Snacks. Bookmark the permalink.